There are many ways to catch steelhead both from the shore and with a boat. Most anglers don’t have access to a boat, so I will concentrate on shore fishing opportunities for steelhead. One of the most common methods for catching steelhead is drift fishing. All that is needed in a medium action rod, preferably 8 foot plus, spinning reel, spooled with 8-10 lb line, some weights, hooks and of course bait. The critical part of this setup is the weights, most anglers use small spit shot about 12-18 inches above the hook. Drift fishing involves casting your bait into the current and then allowing the weights to bounce along the bottom, presenting your bait in the strike zone of waiting steelhead. 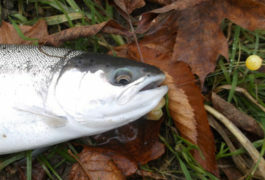 Baits of choice are usually roe, worms and even nymph or streamer flies. Egg imitation flies are also very productive. The key is to adjust your weight to avoid getting snagged on the bottom, you want your weights to just tick the bottom as it drifts along. Using small spit shots is great for this, since you can easily remove or add weight as needed. 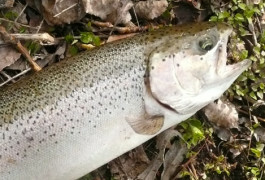 The last skill you need to learn, when drift fishing for steelhead, is detecting bites. This takes some practice, as steelhead have been known to be very light bitters. Another technique used to catch steelhead and probably the most widely used by anglers today, is float fishing for steelhead. The setup involves noodle rods, 9-14 feet long, a float or centerpin reel, some spit shot, hooks, a float and bait. 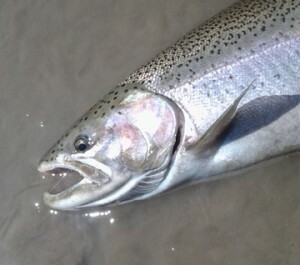 Many anglers also use a spinning reel for this technique although die hard steelheaders will all use a centerpin reel. Centerpin reels allow you to float your bait down river seamlessly which is the key to success when fishing for steelhead using this technique. The rig involves attaching a float to your line, then small split shot, usually 5-8 weights, separated by 1 inch down the main line and then a small leader 12-18 inches ending with a hook. Baits used are the same as those for drift fishing, although spawn in the most common. This technique works best when fishing large deep pools where steelhead will sit to rest and feed. Basically cast out, allow your float to drift down river and when the float goes down, set the hook and fish on! Be ready for the steelhead to leap or run down river, this is one of the most exciting ways to catch steelhead. Once you try it, you’ll be hooked. Still fishing for steelhead can also be very effective, especially when steelhead are staging at river mouths or sitting in large deep pools. The setup is similar to drift fishing except larger weights are used to keep your line on bottom and still. Bait used is usually a spawn sac or worm. This is one of the simplest techniques to catch steelhead and can be very rewarding. 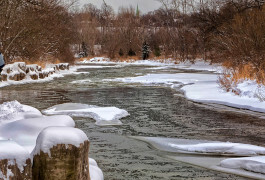 Just wait for the steelhead to take your bait, let it run a little, set the hook and hang on. The fun has just begun. Get out there and learn to fish for steelhead. You won’t be disappointed!